Back in the day parents used to tell kids, "If you don't stop crying, I'll give you something to cry about." I guess "back in the day" in this case means the day in which child abuse was considered kind of funny. 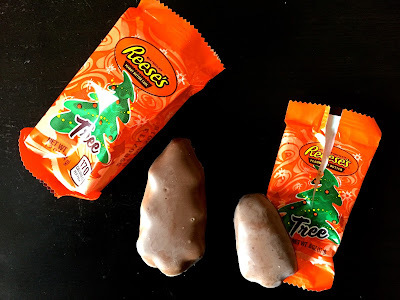 I was thinking about that because while shopping for Reese’s Trees I found a new, smaller size and guess what? These are the kind that (a very few) people have been whining about. See the difference? The standard variety is kind of blobby but the little ones are even worse. As I’ve pointed out before though, all the seasonal Reese’s products are blobs and always have been. These new tree blobs are pretty much just a Christmas version of the Halloween Reese’s Ghost blobs. 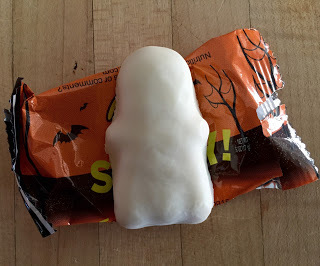 Like the bigger blobs, the ghosts and the tiny trees have a better peanut-butter-filling-to-chocolate ratio than the standard Reese's cups so what they lack in verisimilitude they more than make up for in taste. I'm not sure what kind of absolutely perfect life a person would have to be living to be outraged by less-than-photo-realistic food sculpting but if you want to cry about candy you now know what kind to buy. Grab 'em and grumble. Just don't do it in front of me or I'll give you something to cry about.